Artist Monica Jahan Bose is using her art to draw attention to the ravages of climate change in her native Bangladesh. Even with a heavy video camera I couldn’t resist walking straight into the aggressive waves with her. I was filming Jalobayu (climate in Bengali), Monica Jahan Bose’s collective performance piece, at Select Art Fair in Miami Beach. The performance started indoors with a group of women who all quietly carried 216 feet of sari to a ritual site outside on the beach. 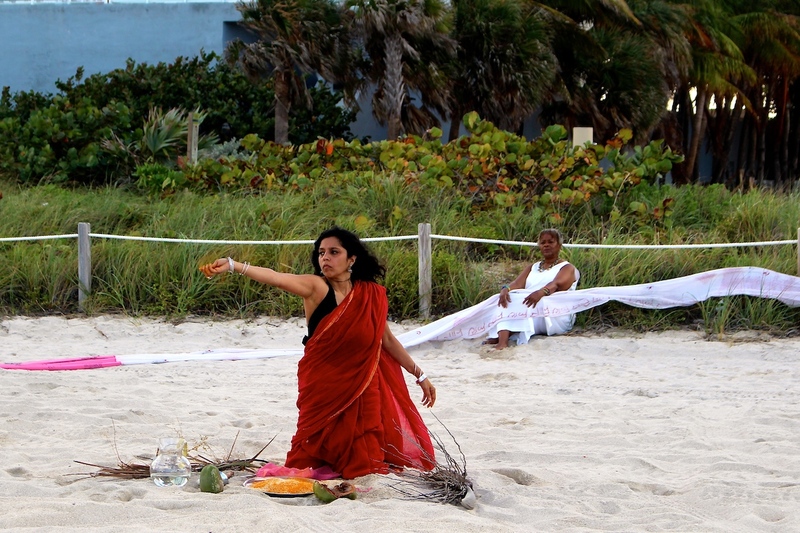 After a series of symbolic activities on the sand, Bose eventually wraps herself in a red sari and enters and battles the ocean in a breathtaking statement on climate change. I was trying to do the math on how Bose went from 18 feet of fabric to 216 feet for the performance, and found out the sari that was communally carried is made up of 12 saris worn for 8 months by 12 women from her ancestral village—Katakhali Village in Barobaishdia Island. “Those saris were covered in woodblock and handwriting done collaboratively by the 12 women and myself back in 2013. After they wore them and used them, they were brought to the US and my daughter, Tuli, helped me sew them together to make this massive sari,” she explained. This just made me even more curious how she got the sari over to the states. “The worn saris were actually transported from the village to Dhaka by boat, and then my mother brought them to me in the US in her luggage.” That same 216-foot sari has been in performances at DUMBO arts festival (called Sublime Virtue), (e)merge art fair DC (Unwrapped), and more. Bose was born in Britain to Bangladeshi parents, and uses participatory installation, film, printmaking, painting, advocacy, and performance to speak to women’s experiences, recently around the disparate impacts from climate change. It’s part of a larger collaborative art and advocacy project called Storytelling with Saris. Bose’s maternal roots are in Katakhali, an island community in Bangladesh on the frontlines of climate change. She collaborates with a dozen women in the community who have acquired literacy and climate adaptation skills to share their personal stories. These women have lost repeated homes to cyclones. The idea is by seeing and hearing these stories, via saris, people in the US and Europe will be inspired to act on climate change. “Americans are learning about climate change through the project and making written commitments on saris to reduce their carbon footprint in an act of cross-border solidarity. The U.S. climate pledge saris will be returned to Bangladesh and worn by the women of Katakhali.” Storytelling with Saris engagements have taken place in California, Hawai’i, Iowa, Maryland, New York, New Jersey, Pennsylvania, Virginia, Washington, D.C., and Wisconsin in the U.S.; Dhaka and Katakhali in Bangladesh; Paris, France; and Athens, Greece. But of course the real power is connecting these stories back to the women’s lived experiences in Bangladesh. The effects of rising sea levels disproportionally falls on the shoulders of poor, marginalized communities of color. According to a MercyCorps piece, one-third of the planet’s land is no longer fertile enough to grow food, but more than 1.3 billion people live on this deteriorating agricultural land. And they’re also the same communities facing more disasters than ever. The number of people affected by natural disasters doubled from approximately 102 million in 2015 to 204 million in 2016, although there were fewer natural disasters. Women in these communities are particularly affected. We can see this in the climate survivors of Bangladesh Bose connects us with. Women disproportionately suffer the impacts of climate change because of cultural norms and the inequitable distribution of resources and power, especially in developing countries. One study also found that 90% of the dead from the 1991 cyclone in Bangladesh were women. Women also at risk of sexual assault and trafficking after extreme weather events where they are rendered homeless. Often under recognized in the climate change movement is how artists are contributing to advance awareness of environmental issues. 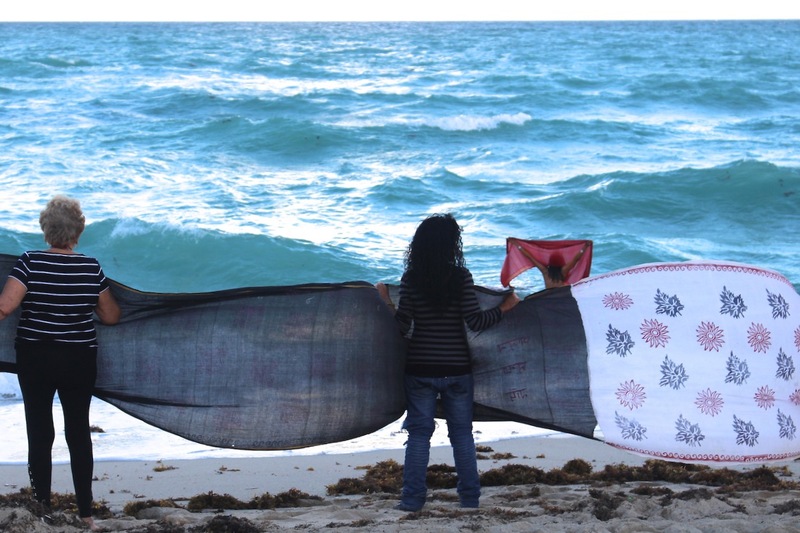 Monica’s work around saris and climate change embrace symbols: the sari represents the female body, and women’s place in the world, and water speaks to life and renewal. She also incorporates wind, sand, rice and water into the performance to represent cyclones, sea level rise, and the loss of heritage and food caused by climate change. 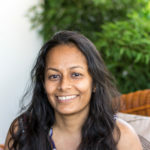 They also reference narratives: Jaloboyu references the Indian myth of Draupadi, the eternal virgin who was married to five brothers, as well as the true story of Bose’s grandmother who was married at age seven and years later swept away by a cyclone. One of the most impressive parts of her art is her ability to move across media and disciplines and incorporate science and policy into her work. Her performance art makes a direct statement on the current state of climate change with the specific perspective of marginalized communities of color. Since 2015, Bose has started making saris with women (and a few men) in the US, France and Greece as part of Sari Climate Pledge Workshops. 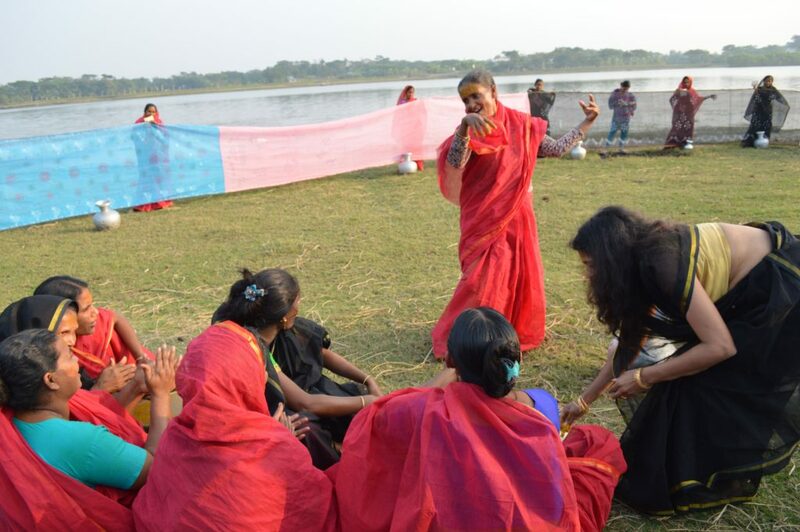 The participants work on a sari with her for two hours while they learn about climate change and how women in Bangladesh are impacted. She teaches woodblock technique and her participants make specific promises that will reduce their carbon footprint. The saris are first exhibited and then returned to Bangladesh for the women in her village to wear. While I will continue to be mesmerized by Bose’s ability to master so many different art forms and connect them to today’s issues, I’m most touched by how she’s been able to give a space for her community in Bangladesh to connect to this global issue. Like one of her participants, Zakia, said: “Coming to the cooperative and working on the sari art and the performance is what I love most. We want to do more and more of it. It was the greatest joy of my life to be part of the performance by the Darchira River.” And that’s the only way we’ll ever be able to confront climate change—working cooperative with communities across the world.